Ozymandias is a sonnet written by the PB Shelly and published in 1818 ~ its central theme is the inevitable decline of all leaders and of the empires they build with the lasting power of art, the only thing that has any permanence. An esplanade is a long, open, level area, usually next to a river or large body of water, where people may walk. Understand that the original purpose was to provide clear field of fire for the fortress guns. Esplanades became popular in Victorian times when it was fashionable to visit seaside resorts. Not sure whether the area in Parrys [Chennai] called ‘Esplanade’ was meant to be one in those days. The East India company settlement expanded from Fort St. George to black towns and they used buildings in blacktown to provide cover for their troops. It was on the Esplanade that the High Court was raised (1889-92), and on the site of the cemetery was built the buildings of Law College, which were opened in 1899. 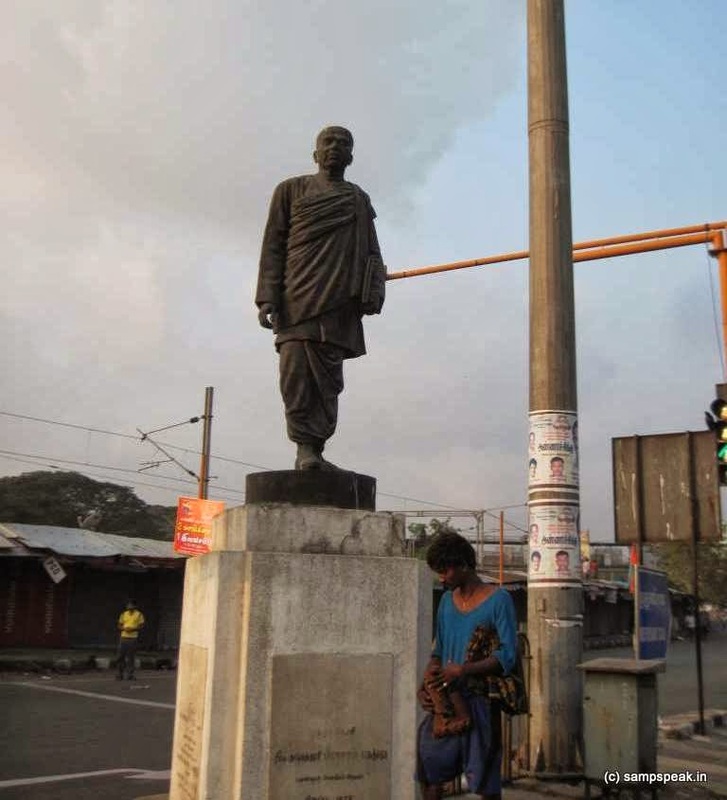 Moving away from history, we have so many statues in Chennai – I have posted on some of them – including the many dotting the Marina beach – most of which were installed during World Tamil Conference in 1969. If you have worked in Parrys / Esplanade area, you perhaps would have got down at Fort station, taken the Foot over bridge or crossed the road – going past this statue which none care to look at these days… it is visible from the EMU too … The other day a couple of men were sleeping at its footsteps – oblivious to its history or the fame of the man, in whose honour it was installed there. Perhaps he has lost more significance since the birth of Telengana and bifurcation of Andhra Pradesh in to T & Seemandhara. The man is ‘Tanguturi Prakasam Pantulu’ (1872-1957) - Freedom Fighter known as Andhra Kesari (Lion of Andhra) and the first Chief Minister of the Andhra state. Prakasam parents were Subbamma and Gopala krishnaya, belonging to Niyogi Telugu Brahmin family; he was born in Vinodarayuni Palem (or Vinoda Rayudu Palem) off Ongole. He was taken to Rajahmundry by his teacher and reportedly failed in matriculation examination, eventually rose to become a lawyer. 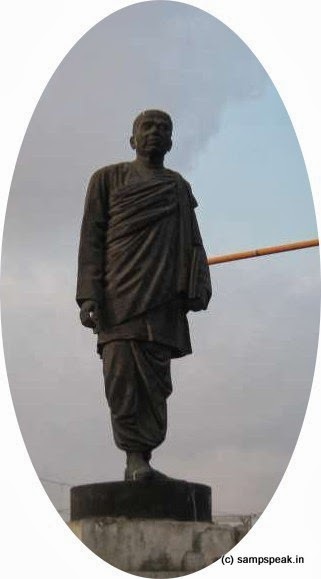 He was elected as Municipal Chairman of Rajahmundry in 1904 when he was 31 years old. This election was a tough one at that point in time. During one of his professional visits to Madras on a court case, a barrister was impressed with his legal acumen and suggested that he become a barrister. He wanted to go England to pursue studies but it was considered a sacrilege to cross the seas during those days and Prakasam reportedly promised his mother that he would abstain from eating non-vegetarian food, smoking and drinking. He reached England in 1904. In England, he joined the India Society and worked for the election of Dadabhai Naoroji to the House of Commons. After completing the barrister course with a certificate of honour in London, Prakasam relocated to Madras high court dealing in Civil and Criminal cases. It is stated that he defended one of the accused in Ash murder case. Prakasam also edited Law times, a legal magazine. The same year he presided over Bipin Chandra Pal’s lecture at Madras when others were afraid to come forward, given that the government of the day considered Pal’s speeches to border on sedition. He rose to leadership in Congress party and chose to give up his lucrative practice. His magazine Swarajya was published simultaneously in English, Telugu and Tamil. He also ran a national school and a Khadi production centre. He was elected the general secretary of the Congress Party in December 1921 at the Ahmedabad session. When the Simon Commission visited India, the congress party decided to boycott it with the slogan "Simon, go back". There were a host of reasons for this boycott, the most important being that the commission did not have a single Indian in its ranks. The commission was greeted with demonstration of black flags wherever it went. When the commission visited Madras on 3 February 1928, the police did not allow protests in some sensitive areas of Madras. 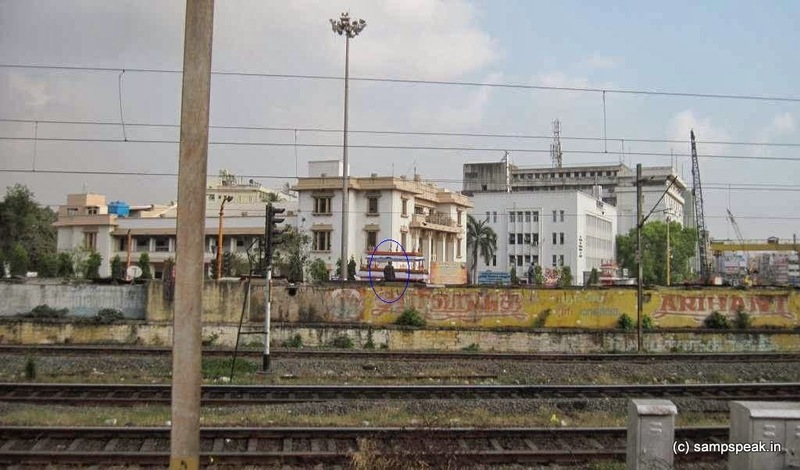 Nevertheless, the crowd grew large and restive near the Madras High Court at Parry's Corner and the police resorted to firing with a view to control it. An youth named Parthasarathi was shot dead and Police warned others of dire consequences. Wikipedia reports that Prakasam grew enraged and tore open his shirt, baring his chest and daring the police to shoot at him which earned him the epithet "Andhra Kesari" (Lion of Andhra). Prakasam also resigned as a legislator and was at the forefront in breaking the tax law at Madras. Meantime, he had to suspend the publication of Swarajya due to the high deposit demanded by the government. In 1937 when Congress contested the provincial elections and achieved majority in Madras province, he was in the run for the CM’s post but made way for Rajaji; Prakasam became the revenue minister – his major contribution was the founding and chairing of the Zamindari Enquiry Committee which looked at the structural distortions in agriculture perpetrated due to the Zamindari system followed by the British Government. He was arrested for participating in the Quit India movement of 1942. In 1946, after the Congress' victory in elections in Madras Presidency, Prakasam became the Chief Minister – the Govt. lasted for only 11 months. In 1948 when Hyderabad was torn, he visited and held talks with Razakars. In 1952, he formed the Hyderabad State Praja Party (Hyderabad State People’s party); in the same year in Dec 1952, Potti Sriramulu died fasting for the cause of a separate state for the Telugu-speaking people. On 1 October 1953, the state of Andhra was created and Prakasam was unanimous choice for Chief minister for the new state. Though popular, the Govt fell after a year. Mid-term elections were held in 1955 by which time Prakasam had more or less retired from active politics. Reportedly he died in 1957 as a poor man after holding high posts. There are many institutions in Andhra named after him. The autobiography of Prakasham was titled "Naa Jeevitha Yathra"(My life's Journey)…… not sure whether Andhra Kesari lived in Broadway – but by some accounts he led the agitation against Simon Commission and took up on Police at Esplanade, where his statue stands now. May be next time you cross this place, you might recall the history behind the statue. In May 2000, a life-size bronze statue of Tanguturi Prakasam, was unveiled in the Parliament House by the President, Mr. K.R. Narayanan today.